Tiki Tumble, from Push Gaming, is giving us a Pacific Islands kind of vibe, with the Tiki gods and idols being at the center of the action. Tiki Tumble’s atmosphere will be a good one for players that enjoy a good tropical island design, but the action’s focus seems to be elsewhere. The design doesn’t focus on some tropical vacation and on cocktails, using instead an erupting volcano in the background, which threatens to destroy a local civilization and their way of life. You have exquisite graphics in Tiki Tumble, and they’re going to be focused on showing you the surrounding region and the various gemstones and Tiki statues from the reels. These are the two types of symbols that you will encounter, the Tiki Statues colored in yellow, orange, pink, green or blue, along with gemstones in different cuts and colored in teal, green, red and pink. It’s a design style that I loved playing through, a modern release that shows us that Push Gaming can do a good job in this area. 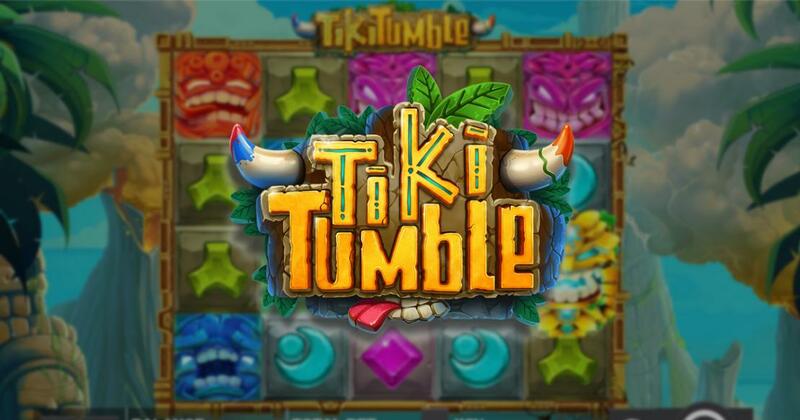 If you’re interested in Tiki Tumble, you should know that it will offer Nudging Wilds, scatters, free spins and multipliers, all interesting features in this case. 5 reels with 4 symbols each will host only 20 fixed lines, even though there was room for a lot more. You win up to $7,500 from its combinations. Selecting the Total Bet is the only thing you need to do before you start playing. The dozen options will vary between $0.20 and $100, so you get up to $5 line bets. Stacked Idol Wilds are used on the reels, and they are substitutes that work on regular symbols, plus they also form wins which pay up to $2,500. Nudging Wilds occur when the stacked wilds occupy the top three positions on a reel. The nudge will help them move down and cover the fourth position as well. Next, you will get a respin from the other reels. Scattered Golden Mask icons will act as your triggers for the free spins. The reels 2 and 4 are filled with wilds, while 1x to 3x multipliers get applied to all wins. The multiplier goes up whenever the Nudging Wilds triggers. Tiki Tumble does well enough for itself, featuring high-end graphics, a decent theme and a unique mix of features.